White awareness ribbon keyring/bag charm with a rhinestone butterfly charm and sparkly shamballa bead. 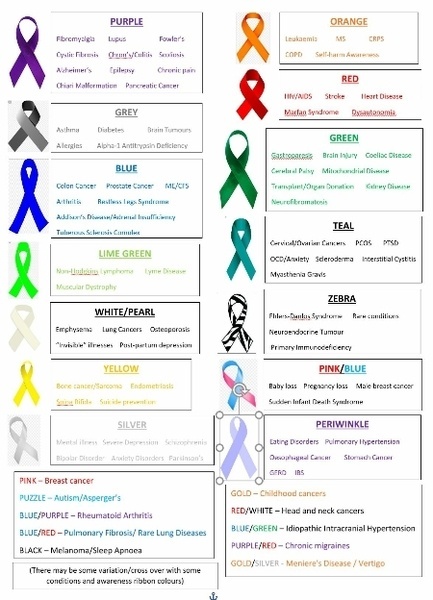 Emphysema, lung cancers, osteoporosis, “Invisible” illnesses and post-partum depression (There may be other conditions symbolised by the white ribbon, however these are the most common). This pretty keyring/bag charm is made using a variey of beads including a 12mm focal “shamballa” style bead, 6x8mm and 4x6mm crystal faceted beads. The keyring loop is a 20mm silver tone split ring and the pretty charm is a 29x36mm enamel rhinestone butterfly. The total length of the keyring is 8.5cm. This sparkly keyring would make a lovely general gift for any woman or girl and also perfect as an “awareness” gift for any chronic illness sufferers/supporters. It could also be used for party/wedding favours and is available in a variety of colours (please see separate listings). The butterfly is sometimes used to symbolise remembrance and so therefore this keyring would also be suitable as a remembrance keepsake/gift. The medical condition of your choice (from the list symbolised by this colour) can be added to the keyring for an additional 50 pence if desired. Please add which condition you would like in the ‘Order Notes to Seller’ box, or leave blank if you would like to keep the keyring as per the original image. This item is ready to post (in the variation shown) and should be packaged and posted within 3-5 days. If personalisaion is required then it may take up to a week to be custom made, packaged and posted. However if this item is required urgently then please send me a message via the “Contact Craftie” option and i will endeavour to dispatch it as quickly as possible. The product will be packaged in a pretty organza gift bag but extra gift wrapping in tissue paper is also available if desired at a small extra charge. Please send me a message via the “ask a question” option to request gift wrapping. Items will be posted in a bubble wrap “jiffy” bag via 2nd class post as standard, however 1st class postage available if required at a small extra charge. I (will) have many other “awareness” items available in my Craftie shop, please take a look! I am a qualified radiographer but unfortunately had to give up my much loved job in September 2011 when my lung problems really kicked off (after suffering multiple pulmonary emboli), resulting in frequent and lengthy hospital admissions. One Christmas I was stuck in hospital, in a sideroom on my own, for 6 weeks so I started making earrings to pass the long lonely days. I then taught myself to make bracelets and necklaces and gradually moved on to bag charms and other gifts. These were very popular with staff, visitors and patients. I carried on with my new hobby once at home as I was still unable to do much due to my severe lung disease leaving me very short of breath on exertion. Over the last 5 years my mobility has gradually declined and I am currently bed/wheelchair bound due to instability in my joints, as a result of Ehlers-danlos Syndrome, and my lungs only functioning at 25%. I’m on oxygen 24/7 and I suffer from chronic pain and fatigue. Despite all this my brain is still active and therefore I get bored easily and so doing my jewellery helps to pass the time! I have many complex health conditions however I still try to do the best I can, although pushing myself to get out of the house one day results in a few days rest just to recover! If you are not totally in love with your item, I operate a 30 day money back guarantee (excluding custom or personalised items). Where possible I try to send you a picture of your item before posting to check that you are happy with it. Please email me within 14 days of receiving your item, indicating if you would like an exchange or refund. Please include date and details of your order and the problem/fault: Lynneslittlegems@yahoo.co.uk If you wish to return your item, you will be notified of where to send it. Unless the item is faulty, you’re responsible for return postage costs. Once your return is received and inspected, you will receive an email to notify you that your item has been received. If requesting a refund, your Paypal account will be credited within 2 days. If you have chosen to receive an exchange, on receipt of the returned item, a replacement item will be made. In the unlikely event your item needs to be repaired, you’ll be informed how long this will take.